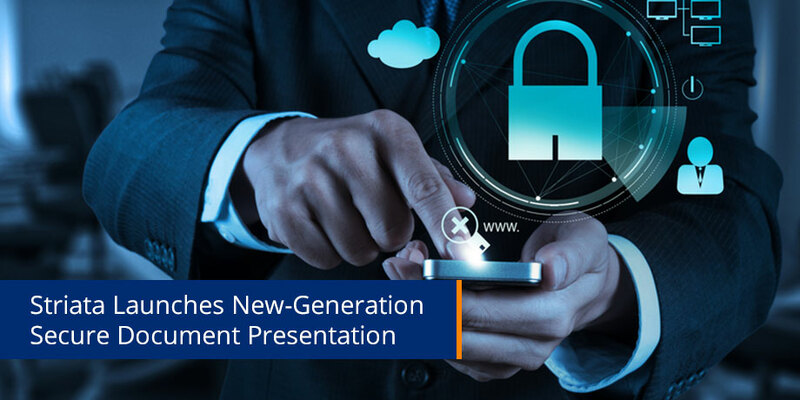 NEW YORK, NY – JULY, 12 2017 – Striata, a global leader in Customer Communications Management software and document security technologies, today announced the launch of its innovative, next-generation solution for the presentation of interactive documents online. The solution is a highly secure method of providing online access to information contained in confidential documents. Designed to interface with existing customer portals, SDP enables a significantly enhanced customer experience through navigation and interactivity, without exposing security vulnerabilities which could put the document contents at risk. Striata’s document security products are highly relevant to the challenges facing organizations operating under the burgeoning threat of data security or privacy breaches. The customer experience of these solutions is a seamless one, adds Wright, as both the storage capability and the presentation layer are designed to integrate into existing customer interfaces (portals, mobile apps), enabling customers to serve themselves in a secure environment. This is useful in the scenario where the document recipient wants to share the contents of a document temporarily with a third party such as a broker or tax consultant. The ‘time to live’ feature is a further way of securing the information by limiting the period of time it is available to be accessed.